Hi! Nice job!.. This thread is a great idea. Thanks for the effort! PS. Have you considered adding links about breeding? I considered breeding but then decided not to worry about it considering there is a forum dedicated to breeding, listed by species. Also, I hope this thread will encourage people to use the search function before posting repeat threads. Good job compiling these. :worship: If this thread becomes popular, this forum might get a little quiet! I'd like to try and figure out code here to link the table of contents to the post with the topic, to make it easier to navigate. Any other suggestions? And please, if you know good care sheet threads, post them here or PM me and I'll add 'em to the proper post. Thanks! 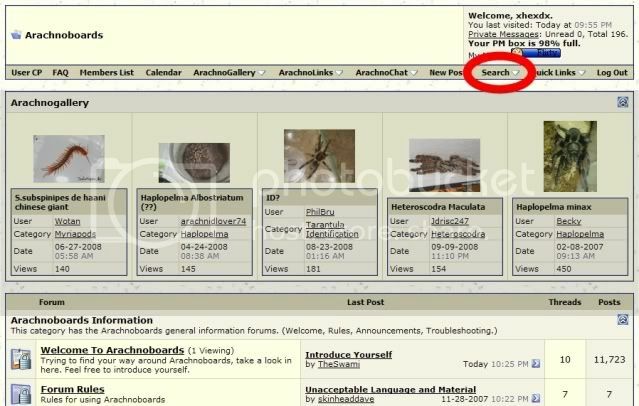 Just to throw a disclaimer out there, it seems the links to search results do not work; I will be giving a search tutorial on here in the next few days. That's a bummer. Why would they stop working all of a sudden? :? I'm actually not sure they ever did. I didn't check to make sure they worked when I posted them, I just ran the search, then copied and pasted the link. Ok, so it works the first time. I think if there are new posts that would turn up in the search, it nulls it out. But I honestly have no idea. Maybe a mod or someone else who has an idea can chime in? The "search" links don't last for long because we *believe* that it clears the cache. It caches the search results and then releases it. Again, not 100% sure but this is what we think happens. This will not happen with direct links, fyi. Oh and please no one post "thanks for making this a sticky". It is pointless and adds nothing and I definitely WILL remove them. You can type the criteria and click 'Go', and that's that. If you would rather do a more advanced search, click the 'Advanced Search' link. 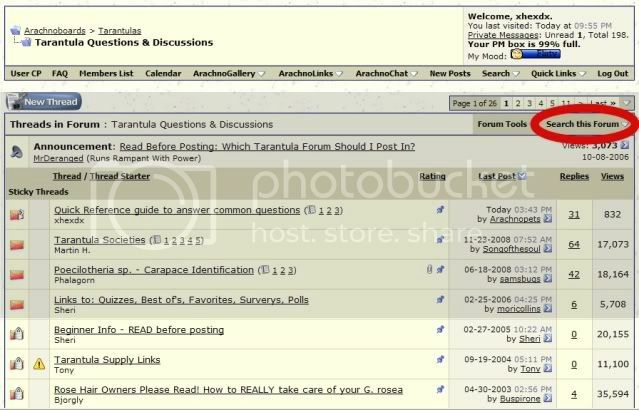 If you are already in a subforum, it will highlight it and only search through there. 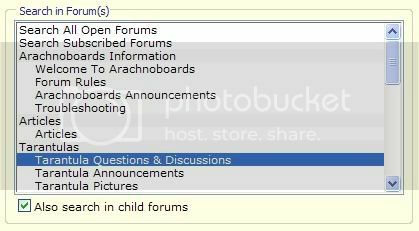 To change the forum you would like to search, just scroll and click the proper forum. And finally, if you are searching for multiple words and would like them all to appear in your search results (as opposed to only one or two of the words appearing), be sure to put quotes (" ") around the words. For example, if you are searching for 'pine bark', you will get results with the word 'pine' only and 'bark' unless you put it in quotes ("pine bark"). Here's a pretty good thread on mites and how to prevent an infestation altogether. Post #9 by Bill S.
Here's a thread on nematodes that got a lot of attention recently. I'm not claiming any of this is accurate; I have no personal experience with nematodes. But hopefully it will be something helpful for others. Can tarantulas find their way in the dark? Per request, here is a detailed how-to on packing specimens for shipping. Arboreal. Tree dwelling tarantulas. These tarantulas need more height than floor space. Terrestrial. Ground dwelling tarantulas. These tarantulas need more floorspace than height. Oppurtunistic burrower. Another name for terrestrial tarantulas, which may or may not burrow depending on conditions and the individual tarantula. Floor space is more important than height. Fossorial/Obligate burrower: A tarantula which will burrow in captivity. The tarantula doesn't really care if they have a horizontal or vertical oriented tank, as long as they have sufficient substrate to dig in. A vertical oriented tank is probably better because then you have a better chance of seeing them in their burrow. Pinktoemembers of the Avicularius genus, often, but not always Avicularius avicularius, "the common pinktoe"
Avic See above, same guys. Pokie Members of the Poecilotheria genus, an Old-World arboreal genus. Known for being fast, defensive, large and particularly venomous. Not for beginners. Debateably, can be kept communally. Rosie/rose the Chilean Rose, (technically, NOT "rosehair") Grammostola rosea a desert terrestial tarantula. Currently the hobby standard for new tarantula keepers. Docile, easy to keep, hardy. Also known as "pet rock" due to their extremely docile nature. Also known for being very variable in temperment and occassionally flipping out for no discernible reason. Pet hole either a pejorative, or affectionate term for obligate burrowers, especially ones prone to not coming out much.